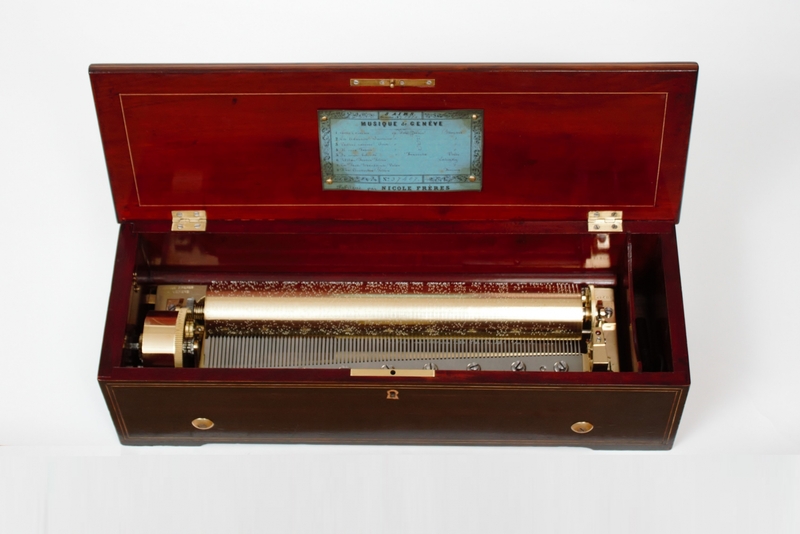 Rosewood cylinder music box with Mozart airs by the fine makers Nicole Frères. 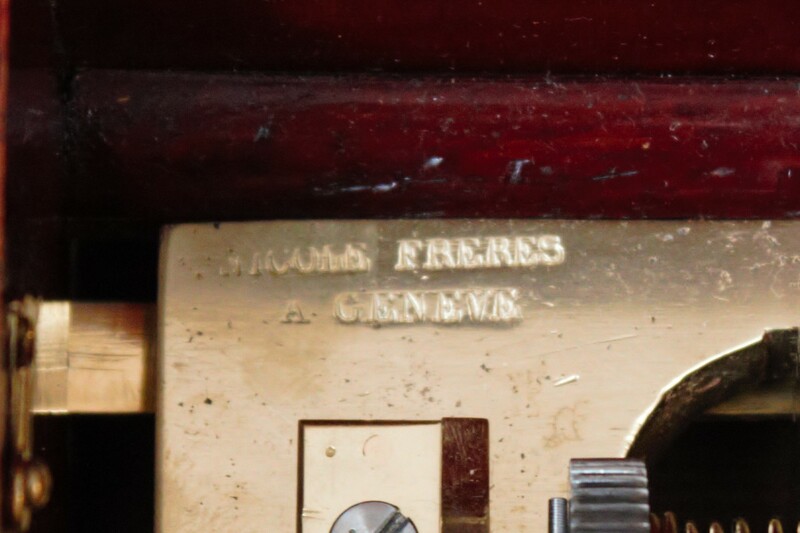 The brass mechanism is marked NICOLE FRERES A GENEVE 37407 and is wound by a key from the side. 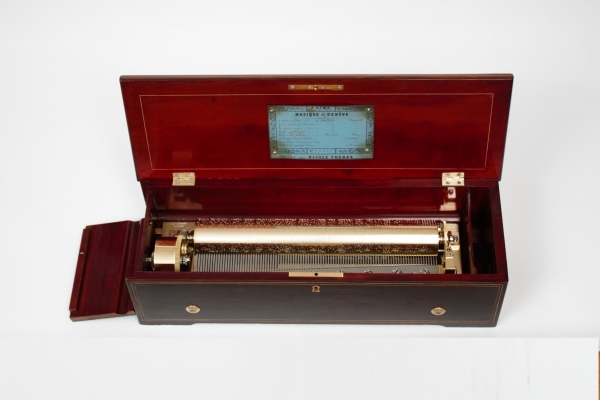 It plays one of eight melodies with a 33.5-cm pinned cylinder on a steel comb also marked NICOLE FRERES. To the side there are three operating levers. The front one is used to stop the playing directly. The middle lever is used for start playing and stopping at the end of the melodie. The back lever is used for either repeating the melody or changing the melody. 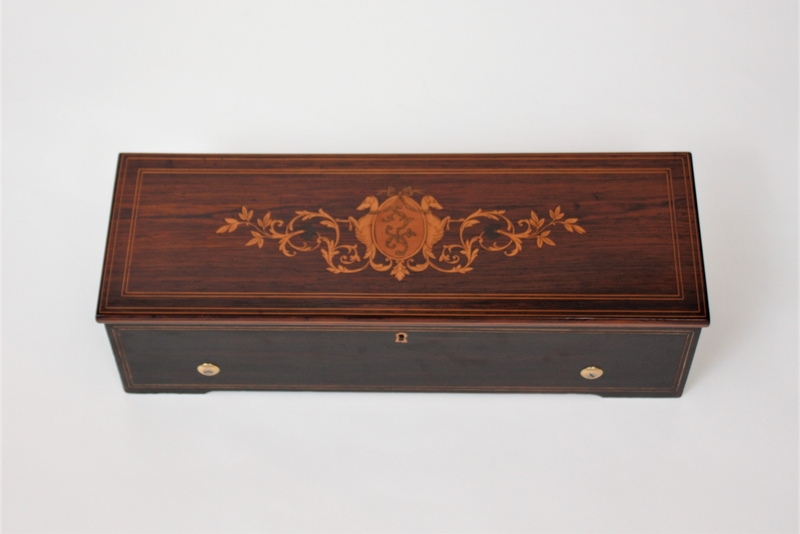 The rectangular case has a lid that is veneered with rosewood and has string inlaid banding. In the centre there is a marquetry ornament with dogs, foliate scrolls and a cartouche. At the side there is a lid behind which the levers and winding arbour are located. 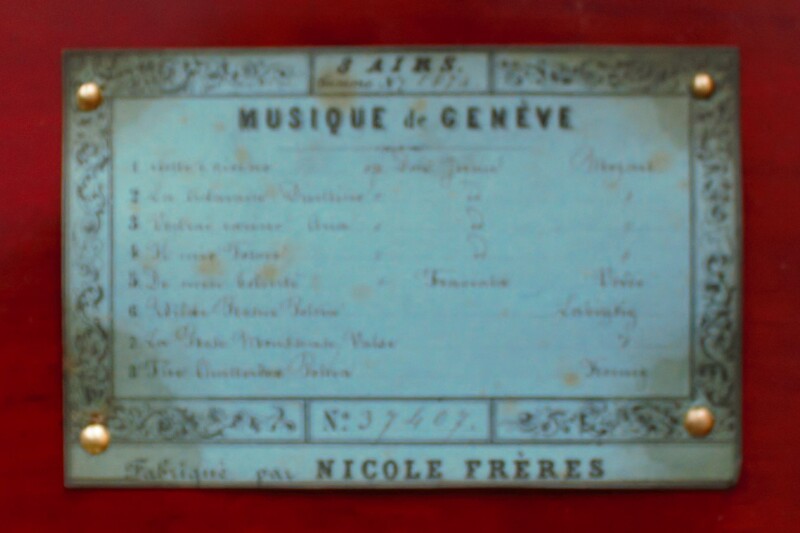 On the inside of the lid is the tune sheet which is also marked NICOLE FRERES GENEVE 37407. 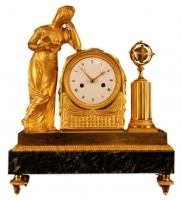 Nicole Frères must have been founded around 1815 – 1820, but production really got on the way around 1825. Two brothers Nicole, Pierre Moïse and David Elie were the driving force while a third brother Auguste Raymond also worked there for some time. One of David Elie’s sons named Pierre François Emile Nicole (1835 – 1910) gradually took over the firm when his uncles and father got older. In 1884 M.E. Brun takes over the firm while keeping the firm’s name. It will continue until well into the 20th Century. 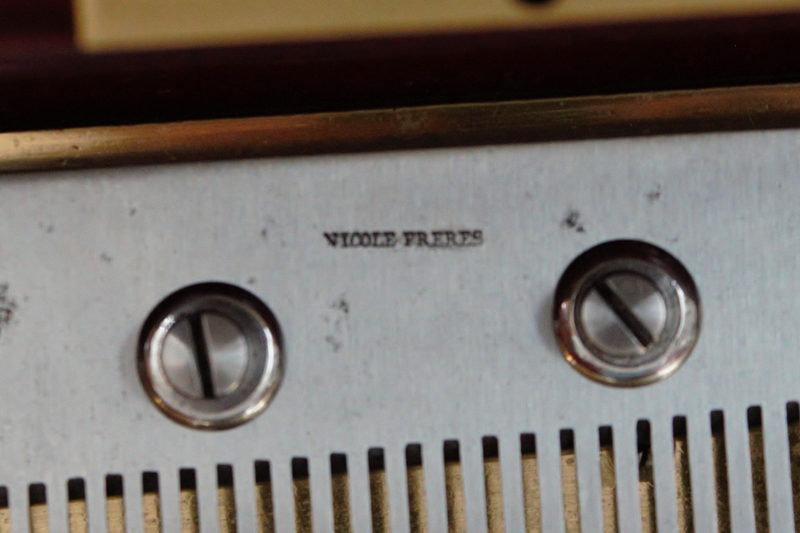 Nicole Freres music boxes are appreciated by many because of their quality ranging from good to excellent. 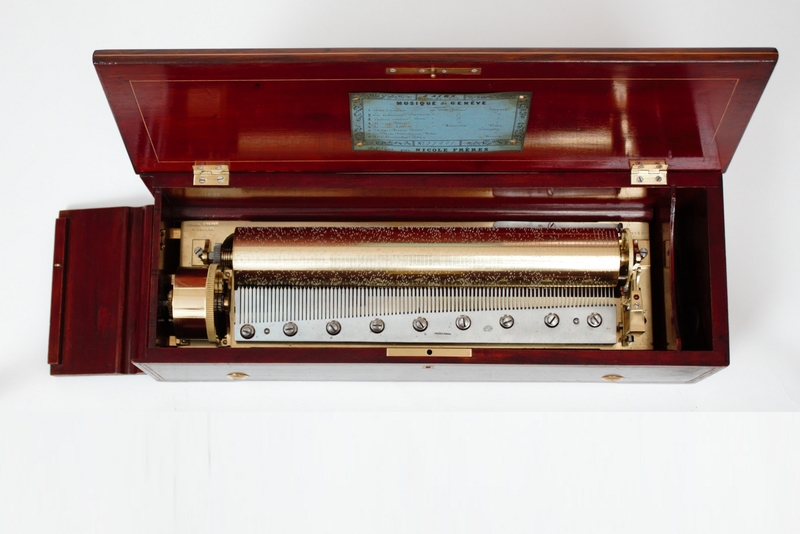 The attention that was applied to the mechanism but also to the sound of the comb(s) and the melody setting make these boxes among the best ever made. Lit. Witteloostuijn en Maas, Muziek uit stekels en gaten, pp. 303- 310.